Spain's Prime Minister Mariano Rajoy heads a special cabinet meeting at the Moncloa Palace in Madrid, Spain, October 21, 2017. MADRID - Spain’s Prime Minister Mariano Rajoy on Saturday said he would curb the powers of the parliament of Catalonia, sack its government and call an election within six months in a bid to thwart a drive by the autonomous region to breakaway from Spain. 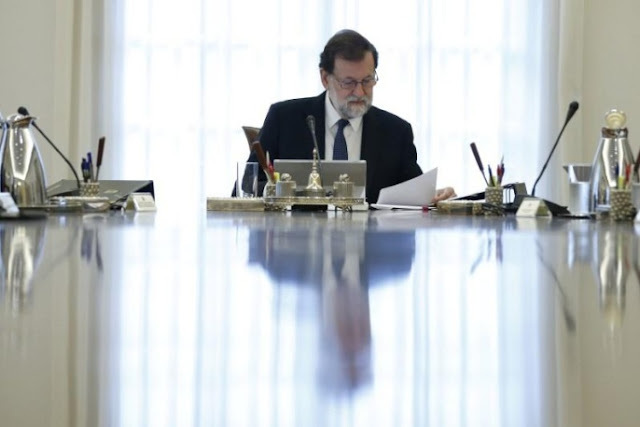 Rajoy said his government had taken this unprecedented decision to restore the law, make sure regional institutions were neutral, and to guarantee public services and economic activity as well as preserve the civil rights of all citizens. The measures must now be approved by Spain’s upper house, the Senate, where a vote is scheduled for Oct. 27. Spain’s Prime Minister Mariano Rajoy on Saturday said he would curb the powers of the parliament of Catalonia, sack its government and call an election within six months in a bid to thwart a drive by the autonomous region to breakaway from Spain.